It’s Speedy Tuesday! Some things do not need introduction anymore and I think that Speedy Tuesday might be one of them. The number of responses to Speedy Tuesday in my mailbox is just unbelievable. Please, keep them coming! It might take a few Tuesdays, but your Speedmaster will be featured here. Today we actually have two Speedmaster watches lined up for you. One of them is the stainless steel version of the Speedmaster we featured here two weeks ago, the Apollo 11 40th anniversary edition of 2009. Two weeks ago, we had the platinum version and now we have the somewhat more affordable stainless steel version on Speedy Tuesday. Further more, we have something quite rare. 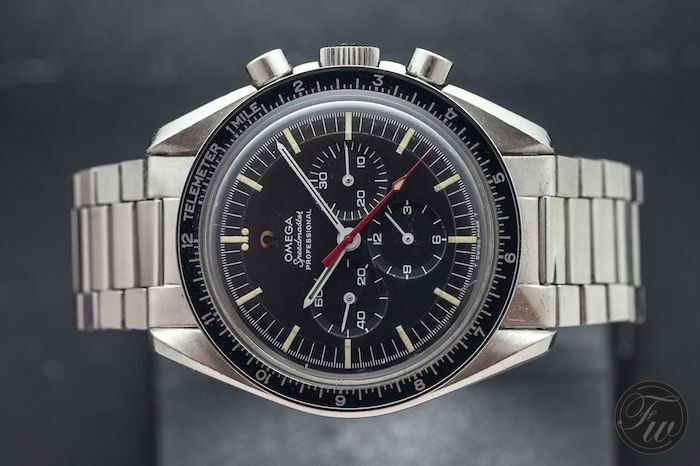 A Speedmaster Professional ref.145.012 from 1967 with a red second hand. All original. More to that one later. Every year OMEGA introduces a limited edition Speedmaster watch during the Baselworld exhibition. Not everyone likes the fact that there are so many limited editions as it takes away the exclusivity of these watches. Every 5 years, OMEGA introduces a limited edition Speedmaster to commemorate the Apollo 11 mission and the fact that it was then that men set foot on the Moon for the first time, wearing a Speedmaster. 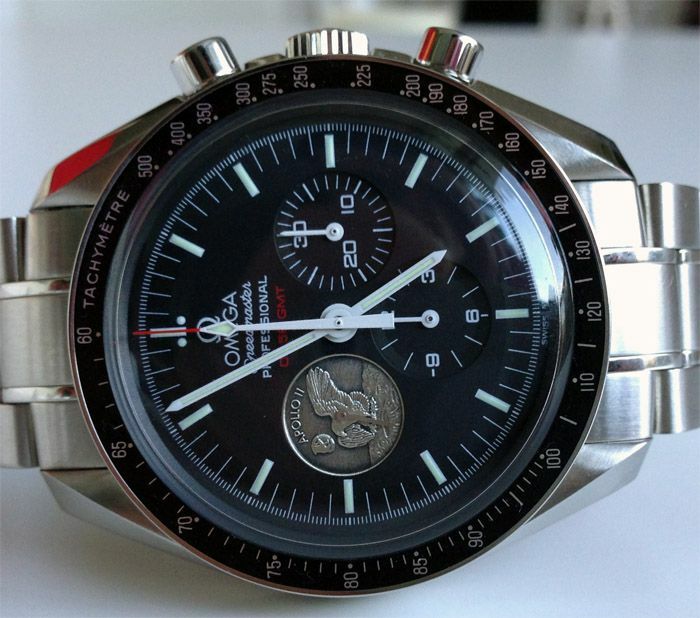 To be honest, I don’t mind seeing a new limited edition Speedmaster Professional every year. Until now, most of these limited edition tend to do very well after a few years on the market (and sold out at authorized dealers). 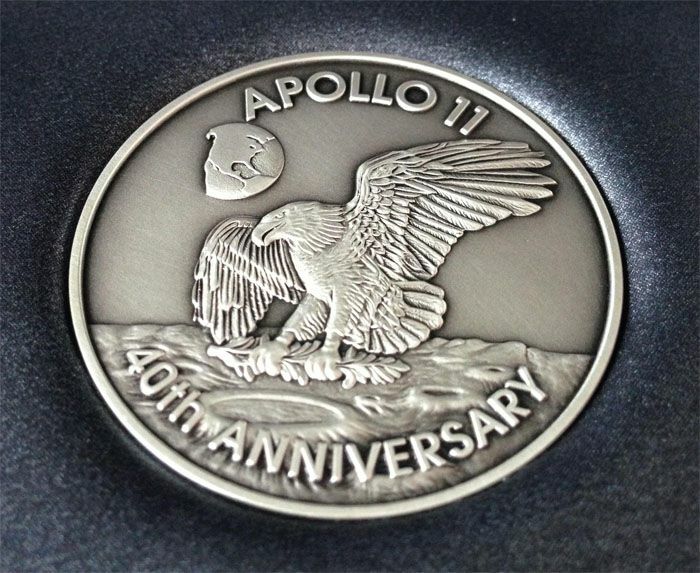 I guess the Apollo 11 40th Anniversary edition will be one of them too. Darren Townend sent us these pictures of his OMEGA Speedmaster Pro Apollo 11 40th Anniversary edition. Darren is a true Speedmaster fan and owns several of them. He is also active on the Australian OmegaForums.net website. 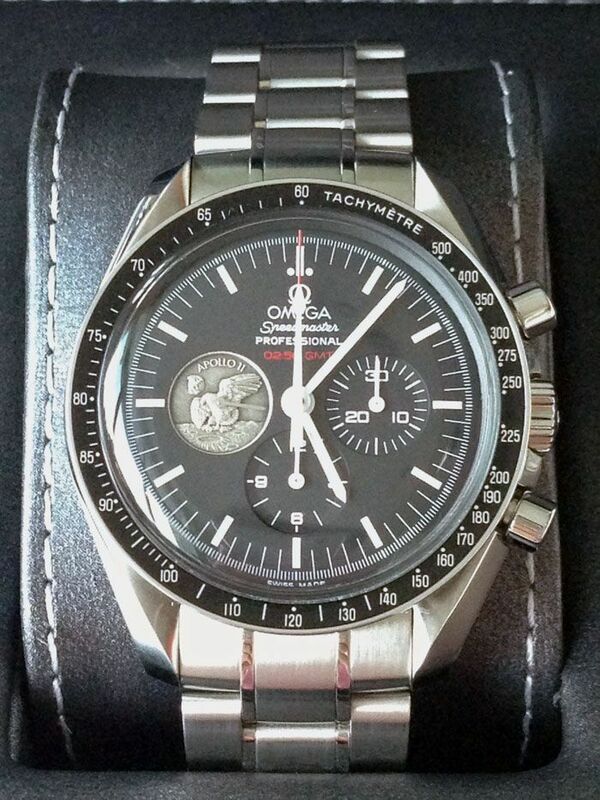 The Speedmaster Professional 311.30.42.30.01.002 came with a nice black presentation box including a silver medallion to commemorate the Apollo 11 lunar mission. 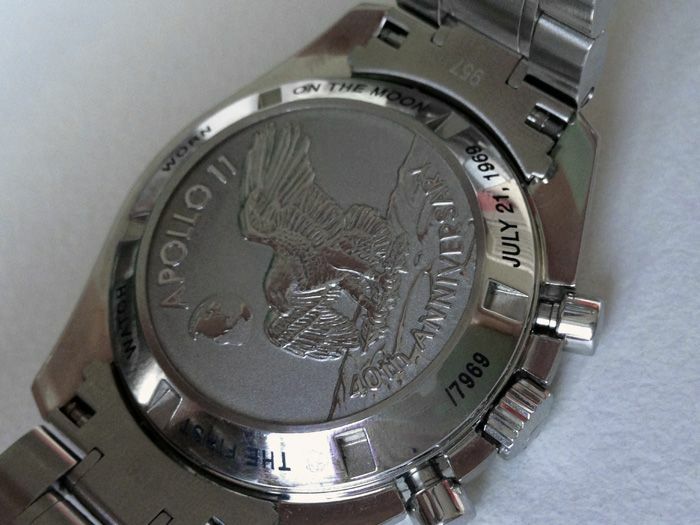 The sub dial at 9 o’clock also feature a silver medallion, showing you the American eagle. 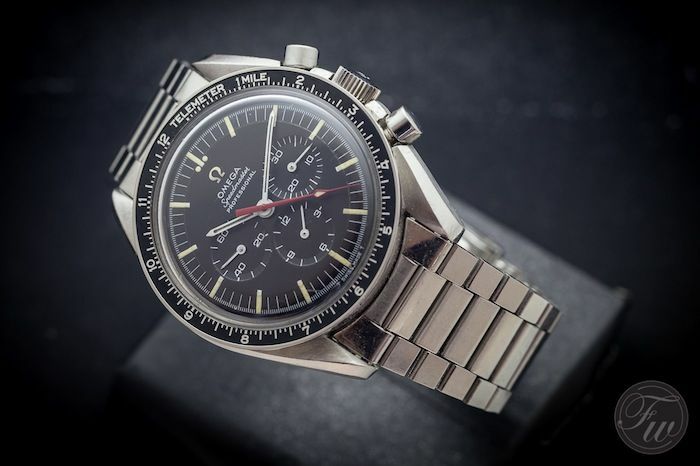 This limited edition Speedmaster Apollo 11 edition is restricted to 7969 pieces only. It may sound like a large number, but I’d like to remind you of the Speedmaster Snoopy edition that was also limited to 5441 pieces and there is no fun anymore in buying that one from the (pre-owned) market. Inside the Speedmaster Professional Apollo 11 edition ticks the Lemania based caliber 1861 movement. The famous handwound caliber, one of the few movements that OMEGA did not apply the Co-Axial movement to. Although it is a very nice chronograph movement to observe (although the caliber 1863 is even prettier), I love the stainless steel caseback on this particular edition. On to something vintage in this week’s Speedy Tuesday! I’ve seen them before and I always wondered whether it is original or simply a replacement hand. Just a few weeks, Bert Buijsrogge and I visited the OMEGA Museum in Bienne and one of the guys over there showed us his Speedmaster Professional with red hand. This reference 145.012 Speedmaster dates back to 1967 and has the column wheel movement caliber 321 and applied OMEGA logo on the dial. The red second hand seems to be a hand that is similar to the ones used on the post-1968 models, with the straight short-end. The person from OMEGA told me that it was definitely all original and that some of the Speedmaster just were delivered that way. Wether this was on special request by the customer (or jeweler) is not clear to me. I did find an interesting old thread on the WatchUseek OMEGA forum from approx. 5 years ago, discussing these timepieces as well (here and here). In that discussion, there are 2 or 3 guys with the same Speedmaster Pro with an identical red hand. The red hand has aged over time, just like the rest of the hands. Also, one of the people participating in that discussion says it was his father’s watch and that he was pretty confident that the watch never had been repaired or received replacement parts. However, the fact that they keep popping up every now and then, with identical red hands and the fact that OMEGA did more ‘undocumented’ things in those years, make me believe that it could be perfectly original. Also, I remember seeing this watch on the wrists of Brandon Thomas, former curator of the OMEGA Museum in Bienne. It turned out to be his former watch anyway. I also remember I had a similar discussion with him when visiting the museum in 2011. In any case, I think the red hand looks really cool. Authentic or not. Happy Speedy Tuesday! Also make sure to join us on #instagram (@fratellowatches) and share your Speedmaster with us using a #speedytuesday hash tag.